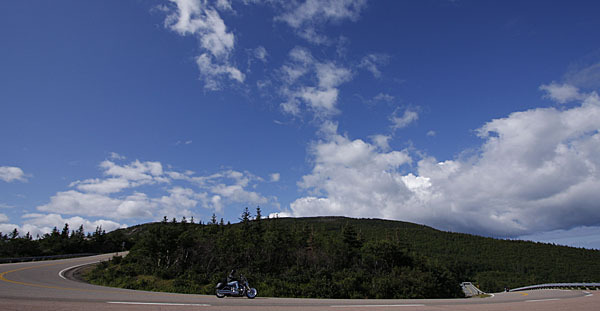 Carlo Alcos takes on Peggy’s Cove, Guysborough, and the Cabot Trail. AFTER LIVING in New York City for three months, I was ready for a little “vacation.” Halifax, Nova Scotia, seemed the perfect antidote to the craziness that is the Big Apple. I pictured wilderness, lots of green, wild ocean, and overwhelming friendliness. Canada’s Ocean Playground didn’t disappoint. While Halifax itself deserves a thousand words, I’ll be talking about getting out of it — hitting the pavement for some good ol’ fashioned road trips. So hop in your rental, check the mirrors, and make like a bakery truck (i.e., haul buns). Follow along the routes with this detailed road map of Nova Scotia (PDF). 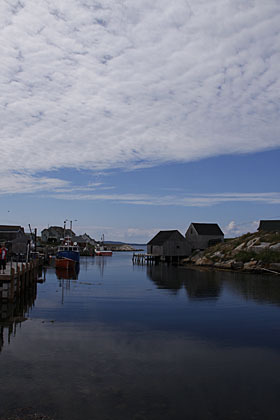 Peggy’s Cove is far from secret. In fact, it’s home to the self-proclaimed “most photographed lighthouse in the world.” It’s only about 45km from Halifax on the South Shore. While I was there, a man with his little boy was standing on a rock half-submerged in the lapping waters. People from the top yelled down to him to get back. There are signs warning visitors of the danger; folks have been swept away never to be seen again. Check out this video for a scary tourist moment (the waves weren’t like this when I was there). Don’t be a Darwin Award nominee. Besides the lighthouse, you can browse around the tiny village (population: 46 as of ’09) and visit the memorial site of Swiss Air Flight 111, which crashed into the ocean nearby in 1998, killing all 229 passengers and crew. It’s about a kilometer up the road. Hopefully you’ll be more respectful than the two little brats running around the place yelling, “What IS this place? It’s stupid!”, with the parents not doing anything. 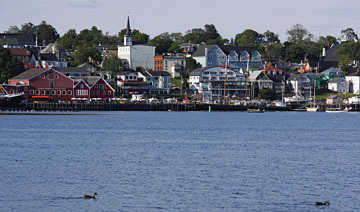 Mahone Bay is about an hour west of Peggy’s Cove along the 103. Before town, pull over across the water for a look (and a snap) of the three church steeples lined up, towering over the trees. It would be a great place to kick your feet up for a night, but is still very relaxing to just stroll the street, popping in and out of boutiques and ice cream shops, and getting a closer look at the iconic churches. A further 15 minutes down the coast is Lunenburg. It’s the home port of Bluenose II, the fishing schooner whose original namesake is on the Canadian dime. Unfortunately, the boat is under restoration until March 2012. Old Town Lunenburg is on the UNESCO World Heritage List, and is only one of two urban communities in North America to claim that distinction (the other being old Quebec City). The historic site sits on a steep hill that slopes down to the marina, where Bluenose II would be docked. There are a few nice restaurants water-side with big patios for ocean views. I ate lunch at the Rum Runner Inn. There were other diners gorging on all-you-can-eat mussels for $15. They looked good, and if them ordering multiple bowls is any indication, they must have tasted pretty good too. Tip: For a good view back to the historic town, drive around the water to the other side where the golf course is.